Free cooling function for maximum efficiency: STULZ CyberCool Indoor provides powerful, highly efficient chilled water cooling with a minimal footprint. The unit’s modern design and compact construction allows it to be installed inside the building easily, as well as integrated in existing systems. CyberCool Indoor EC was developed for especially stringent project requirements. In order to guarantee chilled water generation to suit requirements, CyberCool Indoor is available in two versions and three different systems. The systems allow for scalable planning and grow at the same pace as your future requirements. "Chilling at up to 100 kW per unit with a minimal footprint – flexible and highly available." The compact CyberCool Indoor also fits through standard doors and can be set up anywhere without any problems. Spatial segregation of the two noise sources and the use of especially quiet condensers or dry coolers minimizes overall noise emissions. As all the important components are integrated in the CyberCool Indoor, its sensitive technology is perfectly safe inside the building. What is more, CyberCool Indoor is perfectly protected from vandalism or accidental damage. 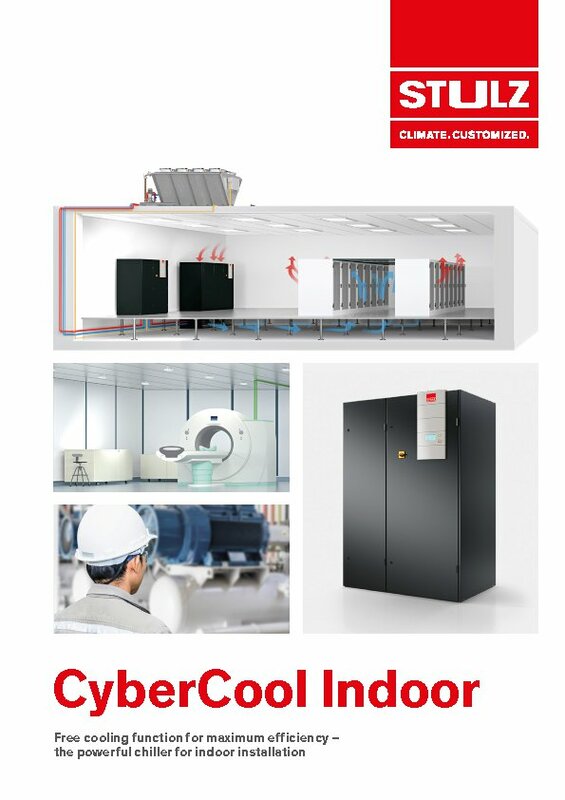 The CyberCool Indoor provides straightforward access from the front, making all the active components, such as compressors, expansion valves and pumps, easy to maintain. The large doors facilitates the access to the electrical cabinet at any time, along with all its electrical components. CyberCool Indoor units are subjected to a full computer- controlled check in the STULZ Test Center. Extensive measurements under a wide variety of conditions show the actual performance data of the systems and components, bringing transparency to the theoretical design data. The European Regulation 5539/16. known as ErP 2018, sets the new SEPR parameters for assessing the energy efficiency of chillers. The CyberCool Indoor complies with the limits required by ErP 2018. Chiller efficiency at a certain condition. relative to the chiller's electricity consumption.